Bushmaster XM15-E2S used in Sandy Hook shootings; image courtesy Newtown Police, via Wikimedia Commons, CC0 1.0. A federal judge recently ruled that the families of Sandy Hook victims can get access to Infowars’ internal documents. 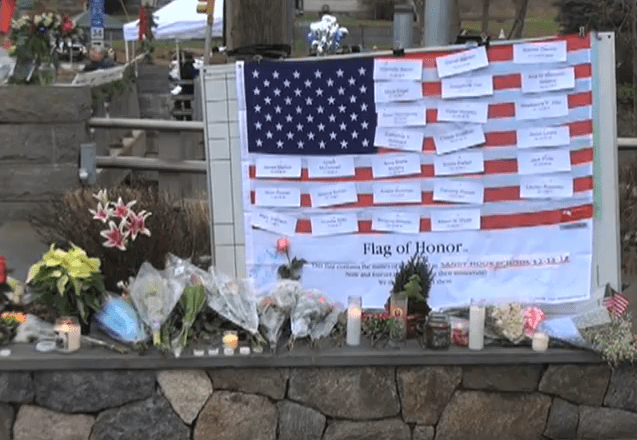 On Friday, a judge ordered right-wing website and radio show Infowars to turn over internal documents to surviving relatives of the 2012 Sandy Hook Elementary School shooting. Hosted by conspiracy theorist Alex Jones, Infowars long claimed that Sandy Hook was a false-flag operation. Victims’ families later filed a defamation suit against Jones, charging him with intentionally spreading untruths. The New York Times posits Friday’s order as a major step forward for the families, who’ve maintained that nonsense stories are an integral part of Infowars’ business model. Along with peddling crackpot theories, its website advertises survivalist gear, firearm paraphernalia and vitamin supplements. As the Times reports, a gunman opened fire at Sandy Hook elementary school just over six years ago. Twenty children and six adults were killed in the Newtown, Connecticut shooting. A memorial to the victims of the Sandy Hook shooting. Image via Voice of America. Public domain. Found via Wikimedia Commons. According to the Times, the plaintiffs in the lawsuit are the relatives of five deceased children and three adults, all killed in the shooting. They’re joined by an FBI agent who responded to emergency calls. The suit says threats from Infowars fans have been so severe that some plaintiffs went into hiding. And the complaint, notes the Times, accuses Infowars of stoking paranoia to bolster its fan-base. By attracting more and more attention, alleges the lawsuit, Infowars can sell more of its products to more people. Connecticut Superior Court Judge Barbara Bellis ruled that Jones will have to turn over Infowars documents, including letters, memos, emails and text messages. According to the New York Times, Jones may have to share anything that concerns business plans, market strategies, Sandy Hook, crisis actors or mass shootings in general. Jones later backtracked on his claims of fakery, suggesting that Sandy Hook victims were themselves the victim of a violent government conspiracy. His attorney, Jay M. Wolman, is fighting to dismiss the suit.